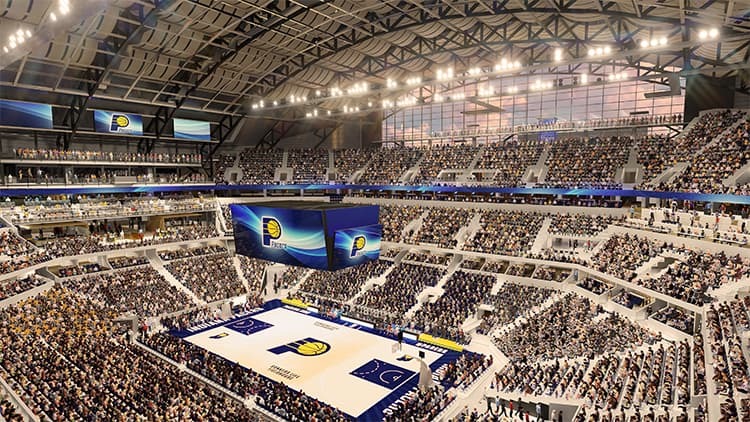 The Indiana Pacers are set to commit their long-term future to Indianapolis after an agreement was reached that is set to herald extensive improvements for the NBA basketball franchise’s Bankers Life Fieldhouse arena. The Marion County Capital Improvement Board of Managers (CIB), which oversees Indianapolis’ professional sports stadia, has approved a resolution authorising funding for the first long-term contract agreement with a major league sports team in the city with no new taxes or fees. The 25-year agreement includes $360m (£274.6m/€318.3m) for capital improvements comprised of an estimated $270m from state and CIB sources and $65m of private investment from the team’s ownership group, Pacers Sports & Entertainment, including real estate purchases needed to construct an outdoor public plaza. The City of Indianapolis also is contributing $25m for public infrastructure needs. The plan also includes investments in future technology capped at $113m. Under the terms of the agreement, Pacers Sports & Entertainment will be responsible for any technology costs that exceed a yearly cap. Funding for Bankers Life Fieldhouse operating expenses, to be paid on a sliding scale beginning at $12.5m with no annual escalators, has been reduced compared to the current contract levels for the first 12 years. Melina Kennedy, President of the Capital Improvement Board of Managers, said: “The Pacers have a long history in downtown Indianapolis, from the move to Market Square Arena in 1974 to the opening of Bankers Life Fieldhouse 25 years later. We are pleased to announce the Pacers will stay in Indiana where they belong for at least another 25 years. The Indianapolis Star newspaper said the new deal, which will keep the Pacers in the city through the 2043-44 NBA season, will supersede the current agreement which was set to expire in 2024. It noted that the contract includes clauses to protect the city’s interests, with a termination fee as high as $750m should the Pacers ever decide to leave Indianapolis during the agreement. 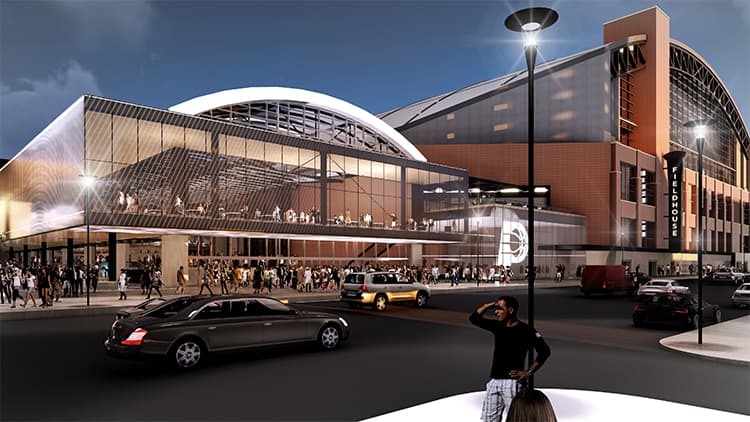 Citing fans’ interest in more social and standing-room gathering spaces, interior renderings revealed on Friday showed the removal of the top eight rows of the upper seating area to improve the fan experience and enhance views of the arena and the city. Other renderings showed an expanded entry pavilion and concourse that could host more community events. In addition to the changes to the footprint of the building, a new outdoor plaza is planned for public use all year long. 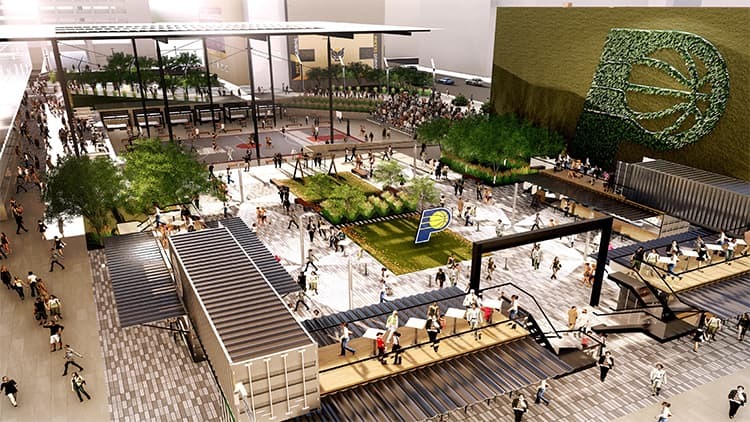 In the winter, Pacers Sports & Entertainment is targeting an outdoor skating rink that would be larger than the iconic rink at Rockefeller Center in New York City. Construction will be completed in three phases. Phase One will focus on interior renovations and is scheduled to run February 1 to October 1, 2020. The building will be closed for events from the end of the 2019-20 Pacers season through to October 1, 2020. Phase Two includes an entry pavilion expansion and exterior construction along with additional interior renovations, which will take place after the Fieldhouse’s staging of the 2021 NBA All-Star Game until December 31, 2021. The building will be closed for events from the end of the Pacers 2020-21 season through October 1, 2021. Phase Three construction will take place between January 1 and October 1, 2022, to complete the entry pavilion expansion, exterior plaza and remaining interior renovations. The building will be closed for approximately 60 days in the summer of 2022. The agreement is contingent on the passage of SB-7. A state funding package, SB-7 was approved by the Indiana House earlier this month and now heads to the Senate.